What happens when you combine twisted sisters with black sheep? “Local Color” happens. Come meet the artists and see their work at the “Local Color Art Show” on Saturday, March 31 from 10 a.m. to 4 p.m.
Melissa Steyer and sisters Beth and Melissa Perkins started showing art in Beth’s back yard 10 years ago, and as their show grew they added the founding members of the Black Sheep Gallery. A tradition began eight years ago and blossomed into an annual event held every year at Whidden’s Marina. Locals consider Whidden’s a step back in time and a treasure of the island. The marina has been there since 1925. Patti Middleton is a local historian and watercolor painter. If you glance around town, you’ll find her work everywhere, from the signs welcoming you to the island to the menu you might be holding while having lunch at one of the restaurants on the island. Classic metal sculptor Stuart Hoeckel will be at the show with his copper sculptures of local flora and fauna. He has been sculpting and creating his art inspired by nature for many years. Festival attendees will get to know Melissa Joiner Steyer for her ability to capture the beauty of nature in her own backyard. She has been capturing the essence of the island since she was a young girl. And she’s also available for portrait work. Daniel Godwin, original Bocanut creator and multi-faceted artist known for his creative use of local fauna to create whimsical creatures, will also be at the show. His love of the island and his ability to capture local art on canvas make for a true treat. Jeweler Beth Perkins, who is known for organic combinations of silver and stones, and also leather and pearls, has been creating simple and organic jewelry for years. Using seashells, stones and sea glass and combining the materials with precious metal, the outcome is beautiful pieces of art. A new member of Local Color this year is illustrator and painter Elayne Sears. She will have several of her sketches and paintings on display. Melissa Perkins, known to locals as one of the original Twisted Sisters, has her own twist on stained glass. 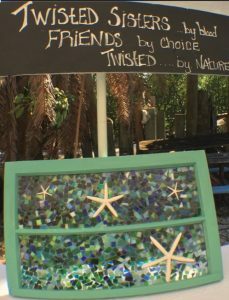 Melissa combines old windows, recycled glass and repurposed objects to create her one-of-a-kind windows. Glassblower Rich Fizzer will be showing his work, which can be found in many galleries around the country. And finally, local legendary artist Carroll Swayze will bring her colorful paintings and her newest book – a coloring/cookbook. Whidden’s Marina is located at 190 First Street East in Boca Grande. Older PostISLAND LEO BEAT: Keeping the GICIA Bike Path safe!